Mumbai, India -- The Mumbai Police today arrested four persons “for further questioning” in connection with the death of Buddhist monk Bhante Sangaraj Mahathero. 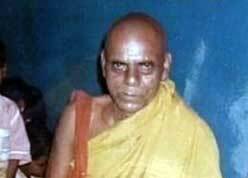 << Buddhist monk Bhante Sangaraj Mahathero - was he murdered? Among those arrested is the builder, Zuber Lakdawala, named in the First Information Report (FIR). The Bhikshu Sangh (Order of the Sangha) alleged that it was a case of murder perpetrated by a builder and a few others who wanted the land around the temple for construction. The monk was found dead with a rope around his neck in his Gautam Nagar room on January 6, sparking tension in Deonar and Govandi. “The four persons who were named in the FIR were summoned by the investigating team. They were questioned and later arrested,” said Deputy Commissioner of Police (Zone VI) Niket Kaushik. “The first accused named in the FIR, Manohar Jadhav (45), was summoned and questioned earlier in the day. Jadhav is the president of the Slum Rehabilitation Authority (SRA) scheme being developed by Lakdawala Builders. Jadhav was presented before the court and has been sent to police custody till January 16. The other three—Dr Vivek Kolekar, Arun Kamble and builder Zuber Lakdawala—were summoned, questioned and arrested later in the evening. They will be presented in the court tomorrow,” said Additional Commissioner of Police (East Region) Hemant Nagrale. The monk’s death has sparked tension in Deonar, Govandi and nearby areas with protesters turning violent, alleging the involvement of a builder in the death. Initially suspected to be a case of suicide by the police, Deputy Chief Minister R R Patil termed it “suspicious”, asking the police to register a case of murder. After the first post-mortem was inconclusive, a second post-mortem was ordered. The viscera reports are expected in a week. The Lakdawala builders were unavailable for comment.